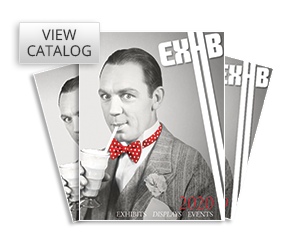 Our print capabilities, combined with our professional, experienced staff and unsurpassed client service provide you with an invaluable trade show graphics resource. Download our print capabilites (PDF) for more information. With remarkable equipment, technology and a superior team, we can produce up to 26,000sq. ft. of display graphics per hour. Our quality control and full service customer satisfaction team includes talented print production crews, sewing and finishing teams, pre-flight art staff and more, all dedicated to producing the best quality display graphics. We are proud to be able to provide consistent, high quality graphics with accurate color to the G7 specification. Continuous evolution and investments in futuristic, remarkably fast digital textile printers enable our production of display graphics in record time on a multitude of material types. As a result, we have the ability to print a remarkable 19,000sq. ft. per hour via eight cutting-edge fabric printers. 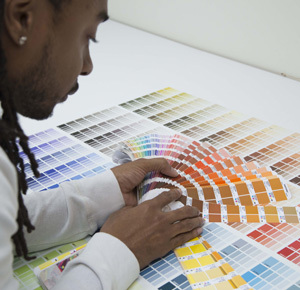 Our high-speed process produces vibrant six-color output over 3 meters wide. Thanks to water based inks and low consumption, the process is a fully eco-friendly printing process. With seven state-of-the-art UV roll-to-roll and flatbed printers, we have the capacity to print over 7,000sq. ft. per hour. Our UV printers provide vibrant graphics with excellent longevity on a variety of rigid and flexible substrates. This print process uses ultra violet light to cure the ink onto the substrates. We also have the capability to print white ink on a variety of materials such as plexiglass, colored sintra or other various custom applications. Talk to your sales representative for more details. Once cured, the ink is bonded to the substrate and will not require lamination. 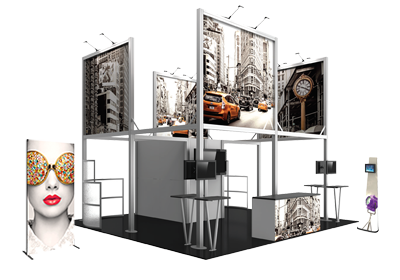 The UV print process is the perfect solution for a variety of product types including Popup mural displays, Orbital Truss displays, contour cut applications and more. Our three high speed UV roll-to-roll printers use vibrant, durable and flexible inks allowing us to print for a variety of indoor and outdoor applications. 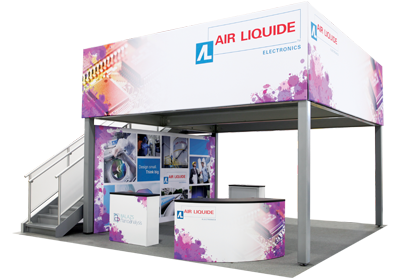 UV printing is one of our most popular and economical solutions for banner stand graphics and outdoor tent applications. We couple tenured expertise in staff with sophisticated, high-end graphic finishing and cutting equipment to ensure faster turnaround times and precise accuracy. Our print production, sewing, finishing and quality control teams are committed to producing superior, excellent quality display graphics. finishes each dye-sublimated fabric graphic by hand to ensure the perfect fit to the display frame. Fabrics are used for a number of products spanning our portable, custom modular and fabric architecture lines. Our team custom tailors all types of graphics from hanging structure, pillowcase and SEG graphics to table throws, tents and outdoor flags. Custom graphic finishing such as zippers, silicone edge beading, hemmed edges and pole pockets are available upon request. 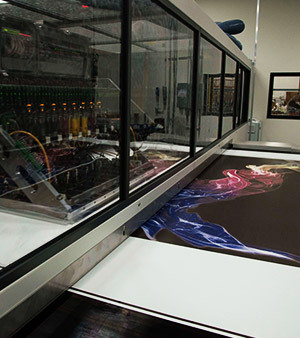 Utilizing four state-of-the-art digital cutting and laser machines, we create fast and efficient workflows for finishing graphics on fabrics, vinyl, PVC’s and rigid graphics. All UV printed vinyl banners are finished on a state-of-the-art automatic cutter, which trims graphics up to 50ft. per minute. The combination of our high-speed UV printers with this cutting technology enables us to provide a remarkably fast turnaround time on all FLATMAXX vinyl banner graphics. 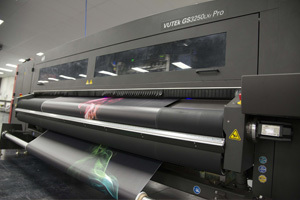 The graphics we provide are G7 certified and printed on state-of-the-art equipment. G7 certification helps ensure the production of the highest quality, consistent and accurate color graphics. G7 specifies the components of an image that define a similar “visual appearance" to the human eye. We are proud to be able to provide consistent, high quality graphics with accurate color to the G7 specification. Other custom rigid materials are available upon request. Please contact your sales representative for more details. Please contact your sales representative for more information. Fabric swatch cards are available upon request.